Cuando un científico quiere atención mediática fácil siempre puede recurrir al truco de bautizar a su objeto de estudio usando referencias pop. 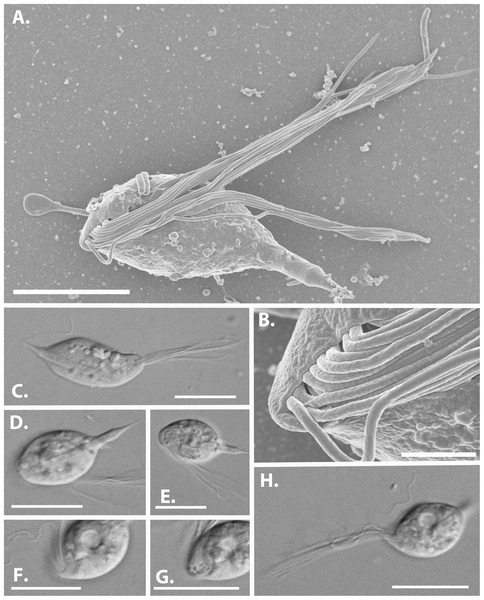 To understand the true diversity of Parabasalia and how their unique cellular complexity arose, more data from smaller and simpler flagellates are needed. Here, we describe two new genera of small-to-intermediate size and complexity, represented by the type species Cthulhu macrofasciculumque and Cthylla microfasciculumque from Prorhinotermes simplex and Reticulitermes virginicus, respectively (both hosts confirmed by DNA barcoding). Both genera have a single anterior nucleus embeded in a robust protruding axostyle, and an anterior bundle flagella (and likely a single posterior flagellum) that emerge slightly subanteriorly and have a distinctive beat pattern. Cthulhu is relatively large and has a distinctive bundle of over 20 flagella whereas Cthylla is smaller, has only 5 anterior flagella and closely resembles several other parababsalian genera.